The composer writes, "Very often, it seems, my music takes on a life of its own. I wasn't sure what I was going to do when I started this composition but it didn't take long for the piece to decide what it wanted to be. The sources of the tape part are not important. The inspiration for the Euphonium line is not important. In my mind, this piece simply IS. 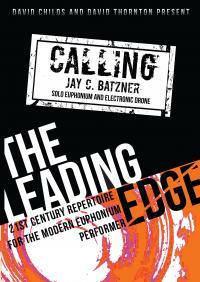 The title, Calling seemed appropriate to me since, to my ears, it sounds as if the soloist is calling out to this eternal droning E-flat that is omnipresent. In some ways, this feels like the first work in this style that I have ever composed. In other ways, it feels like I've been writing this way forever." The backing track for this piece is available as a free download from the DOWNLOADS section of this website. This publication comes complete with composer biography and performance tips from David Thornton. The work can also be heard on David Thornton’s CD Parallel Realities (WOS079) available HERE.